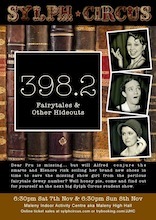 Dear Pru is missing... but will Alfred conjure the smarts and Elenore risk soiling her brand new shoes in time to save the missing show girl from the perilous fairytale dewey number? Well honey pie, you'll find out for yourself at the next big Sylph Circus student show. Featuring special guest narrator, Jeff Turpin and musician Sue Moxon. Food is available from 5:30pm.